After several attempts to gain access to the interior grounds of the monastic site at Kildare we finally got lucky. 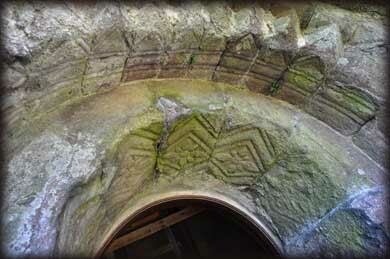 The tower appears to be of early construction, certainly earlier than the beautiful 12th century romanesque doorway. This entrance is built from red sandstone and has four decorated orders. Only the innermost order is complete. 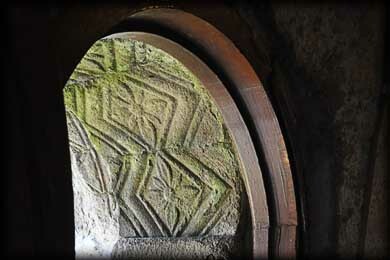 The carvings are typical romanesque motifs, Chevrons, Marigolds and Lozenges. They are the most striking feature of this 32 metre high tower. 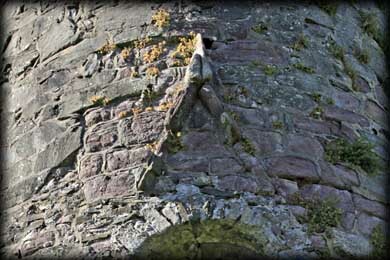 Above the doorway is a pointed red sandstone hood. The doorway is 4.5 metres above ground level. The original conical cap was replaced with castellations during the first half of 18th century. 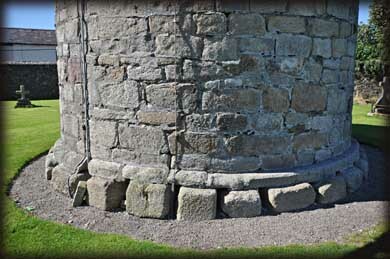 The ground around the tower may be lower - it is now possible to see two offsets at the base, see image below. 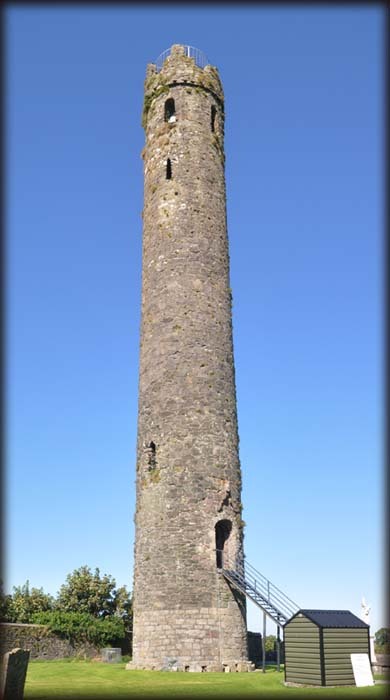 The tower is open to the public and for a small fee you can climb to the top where there are splendid views of Kildare town. Also present in the cathedral grounds are remains of St Brigid's Fire Temple and a plain High Cross. Situated: Very easy. On the grounds of St Brigid's Cathedral in the centre of Kildare Town. Opening Times May – September.Mon. – Sat. 10am – 1pm & 2pm – 5pm Sunday 2pm – 5pm. Discovery Map 55 N 5275 1251: Last visit Sept 2012. Door: Above ground 4.67m. Type: Arched. Windows: Nine. 5 round headed, 2 lintelled and 2 angled. Cap: Replaced with a Parapet and Irish battlements.